In a recent blog post I reviewed Jim Ksicinski’s “Jocks and Socks” book about life in the Brewers clubhouse. He initially came to my attention when I interviewed Pat McBride for my book project this past May. Pat was fascinating to talk to and has lived a very interesting life. 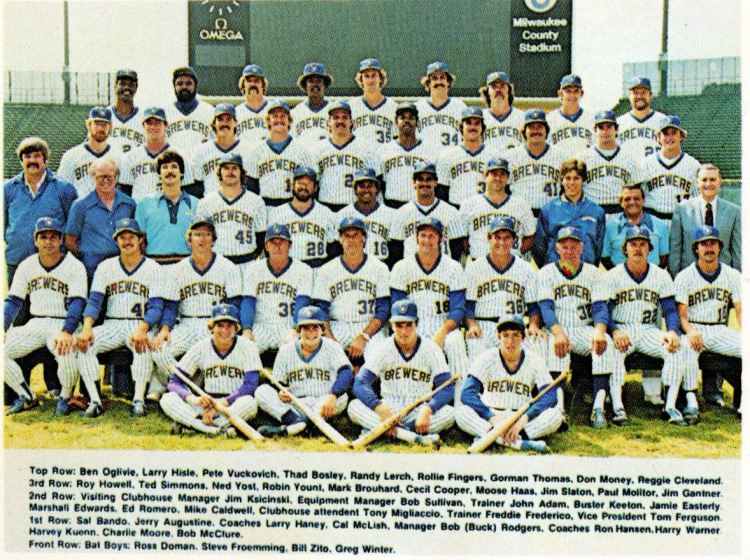 I plan on covering his interview at a later date, but the short version is Pat was a Bat Boy for the first Brewers team in 1970. He worked for Jim through high school and college before leaving to attend medical school. Today Pat co-directs a clinical cardiology program at UW Health and has accomplished many things in the medical field, and has been the recipient of numerous awards in the process. He spent 11 years as the Associate Dean of Students at the University of Wisconsin School of Medicine and Public Health. The person who ran the visiting team’s clubhouse eventually left the position, and the Braves moved to Atlanta. During the years that Milwaukee didn’t have a major league team (late 1965-early 1970), Jim stepped in and worked all the events at County Stadium, such as concerts, conventions, and Green Bay Packers games. The Chicago White Sox also played an exhibition game at County Stadium in 1967 and then a few “home games” there in 1968-69. In the process Jim got to know Bud Selig, who had an office at the stadium. Selig was on a mission to bring major league baseball back to Milwaukee. When the Brewers came to town, Bud Selig and his contingent had a press conference scheduled at the Pfister hotel. As soon as it was over and Selig came down from the podium, Jim asked him if he could have a job with the team. Selig said he would need to talk the general manager, and that led to Jim being hired. Jim retired after the 1998 season and went on to write the aforementioned “Jocks and Socks” book. He offered some great advice to me regarding the whole process of writing and publishing. I won’t share that here, but will say one thing I admired was Jim sticking to his principles in producing a “clean” book rather than a laundry list “tell all” of every off color moment in his clubhouse. He was a great person to talk to – very articulate and an excellent source for behind the scenes baseball information that many fans take for granted. There is so much more I could share from our conversation, but for now I’ll leave it at that. I’m looking forward to weaving Jim Ksicinski’s memories into my book project!